STAR WARS - THE EMPIRE STRIKES BACK - RETURN OF THE JEDI. ONE SHEET ORIGINAL MOVIE POSTER. All photos shown are of the actual poster for sale. If it has any minor defects like pin holes, creases, etc. And they are not mentioned, they should be visible in the high resolution photo. Perfect for a high end home theater. Highly sought after by movie poster collectors and aficionados. Lieberman is the owner and founder of CineMasterpieces. David is a recurring expert featured on The History Channel TV show Pawn Stars. This is a genuine 27 1/16" x 41 3/8" U. One sheet ORIGINAL MOVIE POSTER issued by the studio when the films were re released in 1985 and meant for theatrical display. These can be very difficult to find in any condition! A long time can go by without one of these coming up for sale. You will have trouble finding a nicer one. One of the holy grails for Star Wars collectors. 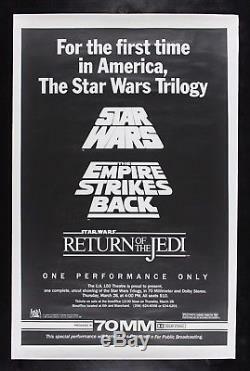 Produced to promote an exclusive one-time showing of the entire Star Wars trilogy in 9 theaters across the U. On March 28, 1985 to benefit the Corporation of Public Broadcasting. Each theater received only 2 posters. They are actually large blow-ups of black and white photographs. He 9 theaters: GCC Avco Center Westwood CA, UA Continental Theater Denver CO, UA Egyptian Theater Hollywood CA, UA Galaxy Theater San Francisco CA, GCC North Park West Cinema Dallas TX, Plitt Carnegie Theater Chicago IL, UA 150 Seattle WA, Uptown Theater Toronto Canada, RKO Warner Theater #1 New York NY. It comes from the man who, in 1985, was the 20th Century-Fox Branch Manager for the Northwest, but he lived in Los Angeles at that time. He was in Seattle on a regular business trip the day of the screening, and he visited the Seattle theater the U. 150 while the movies were showing. At the end of the last showing, the theater manager removed the poster from its frame at the front of the theater and handed it to him. We do not know of any exact replicas of this poster, but even if there are, it is a certainty that this is the original poster, one of two that this theater had, and one of the eighteen in all that was created. No tears, no tape, no pin holes. There are faint oval stains scattered down the right background area and some faint creases scattered through the poster. Small water stain on back. The faint stains and faint creases are not very noticeable or distracting at all, and otherwise, the poster has the most minor of border wear. The paper still has a "crispness" to it. This poster is considered to be within that class and is definitely INVESTMENT QUALITY. This is NOT a reprint or reproduction poster! It is guaranteed to be a REAL ORIGINAL MOVIE POSTER issued by the studio when the films were re released and meant for theatrical display. We are absolutely certain it is authentic. Please read all of the information below before purchasing. Please be advised that over 95% of all Original Movie Posters printed before the mid 1980's were issued FOLDED. Let us sell your posters for you! We guarantee that all posters we sell are graded and described accurately. Unless otherwise specified in the description, all posters are original theatrical movie posters that were displayed (gently used) or meant for display (unused) in theaters at the time the movies were released. We will put in writing that we guarantee it to be an original movie poster. The item "STAR WARS CineMasterpieces RARE HOLY GRAIL TRIPLE BILL ORIGINAL MOVIE POSTER" is in sale since Wednesday, November 22, 2017. This item is in the category "Entertainment Memorabilia\Movie Memorabilia\Posters\Originals-United States\1980-89". The seller is "cinemasterpieces" and is located in Scottsdale, Arizona. This item can be shipped worldwide.